I thought I looked pretty good when I stepped out wearing this to work in the week but then I realised I looked like I did when I was 16 and should probably listen to some Brand New an fully embrace it. It's been so hard to know what to wear this week, I have to wear tights or something long because my job can be quite physical and nobody wants to catch a sneaky peak of my underwear. I'm wearing my new favourite item of clothing again which is my Orphan's Arms t-shirt, not stopped wearing it! We have just plastered the hallway and will clean up all the lovely old tiles soon, will have to another house renovation update post soon. My room is practically finished! I really wanted a dipped hem skirt, I loved the one from River Island but I'm a bit skint before pay day so I opted for the £7 one from Primark instead. They come up a little big so it might be worth down sizing if you are going to get one. What have you been wearing in the sun this week? P.S. I've been using my tumblr more recently which you can find here and there is a giveaway on my other blog Where Are My Knees. Really love this, especially the skirt! 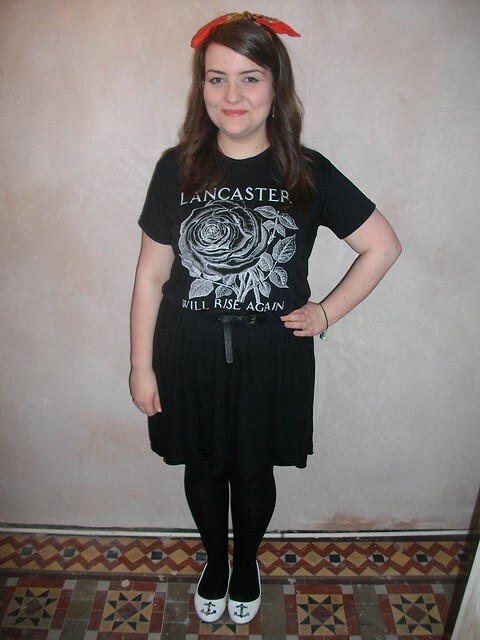 I love this outfit, you look so cute :) and you are looking slimmer by the post, well done Gem!! Been bare legged but with longer skirts for the rest of the week, soooo hot! Also listening to Brand New Loads and TBS. Re-living my teenage days. they are huuuuge! put a belt over mine so it didn't slip off. SUNSHIIIIIIINE! (said with a Manc accent like a Gallagher) I LOVE Maximo Park I am not an acrobat, I cannot perform these tricks for yoooou. yay! I have that skirt too :) I wish they did it in like a 6 though, I wanted it to be way tighter than the 10 I opted for ( and no 8's) that's primark for you ay! Um, those shoes are amazing! !